At least five cruise lines are rerouting their ships to avoid Hurricane Matthew. 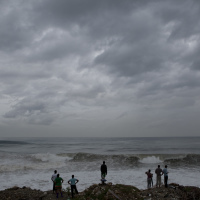 The storm has already brought torrential rains to the Caribbean, sending hundreds of people in Jamaica and Haiti to emergency shelters over the weekend. The category storm could intensify over the next few days. As the hurricane continues its trajectory, several major cruise lines have announced itinerary changes for ships sailing in and out of the Caribbean this week. Royal Caribbean, Carnival, Princess Cruises and Disney are adjusting a number of ships' itineraries to avoid the storm's path. The storm, which is located south of Haiti and Jamaica, has reached wind speeds of 140 miles per hour. Carnival Cruise Line has canceled all ports of call in Half Moon Cay and Nassau and replaced them with a visit to Key West and Freeport. The changes will affect at least six ships sailing this week, reports Cruise Critic. The cruise line firm says it will give passengers a 25% future cruise discount and $100 voucher to use onboard. Carnival is also offering full refunds to those whose original itineraries have been changed and wish to cancel. A spokesman for the company said: "Given the unpredictability of tropical weather systems, and with guest and crew safety as our foremost priority, we are taking a prudent course of action to keep the ship out of harm's way and provide our guests with a safe and enjoyable vacation experience." Royal Caribbean is re-routing several ships including the Allure of the Seas, Freedom of the Seas, Enchantment of the Seas and Majesty of the Seas. Travellers who have booked cruises to any destination in the Caribbean this week are encouraged to call to their cruise line directly. A hurricane warning is in effect for Jamaica, Haiti, the southeastern Bahamas, the Cuban provinces of Guantanamo, Santiago de Cuba, and the Turks and Caicos Islands. Whichever destination holidaymakers are travelling to, they should consider investing in travel insurance.